To create great bass, you need the best in materials and engineering. To create great bass, you need the best in materials and engineering. 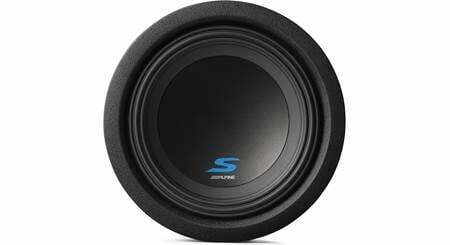 Alpine's S-Series subwoofers apply technology from their higher end subs to bring you the depth and punch that'll make your tunes come alive. And to make things even better, these subs are about an inch shallower than their predecessors, making them great candidates for locations where regular high-power subs won't fit. 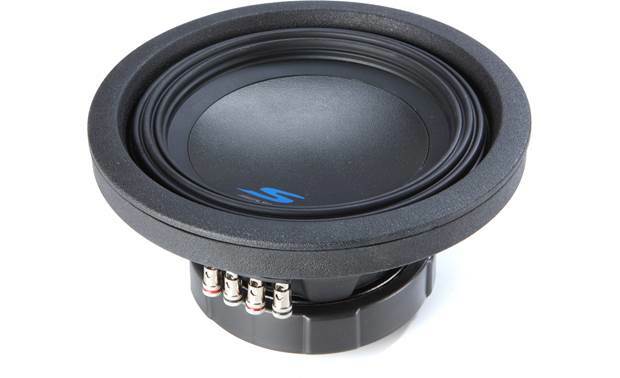 The S-W8D4 8" subwoofer can handle up to 300 watts RMS, so you can drive it hard without any worries. The tough Kevlar® treated cone stays rigid under pressure, while its rubber High Amplitude Multi-Roll (HAMR) surround enables maximum excursion for impressive performance. 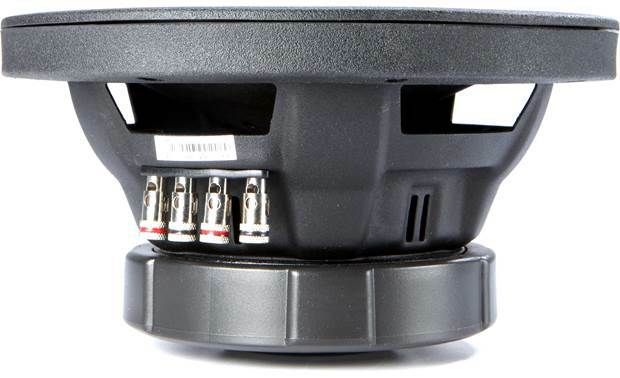 Its dual 4-ohm voice coils allow for extra wiring flexibility, which helps if you plan on adding another subwoofer down the line. Also, it rocks in both sealed and ported boxes, so you can choose an enclosure that suits your tastes. 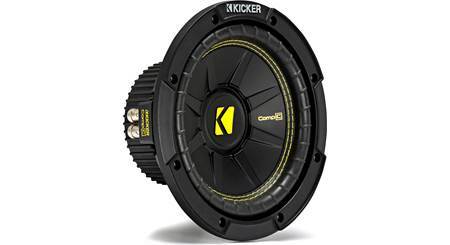 To drive this single subwoofer, we recommend a mono amplifier rated between 225 and 450 watts RMS at 2 ohms. 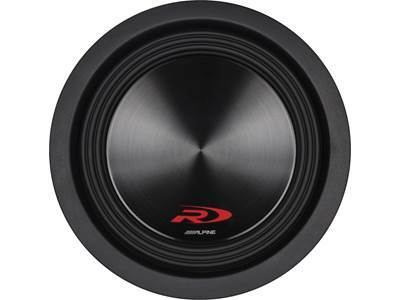 For more information, please refer to our article on How to Match Subwoofers and Amplifiers. 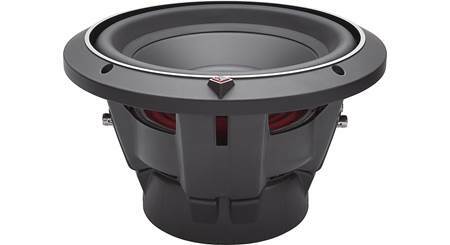 Kevlar Reinforced Pulp Cone: This Alpine S-Series subwoofer uses a parabolic cone structure, with a Kevlar reinforced pulp cone and a Poly-Mica-Talc dust cap. Kevlar adds strength and tear resistance to the woofer cone, while maintaining the damping benefits of a pulp cone material. 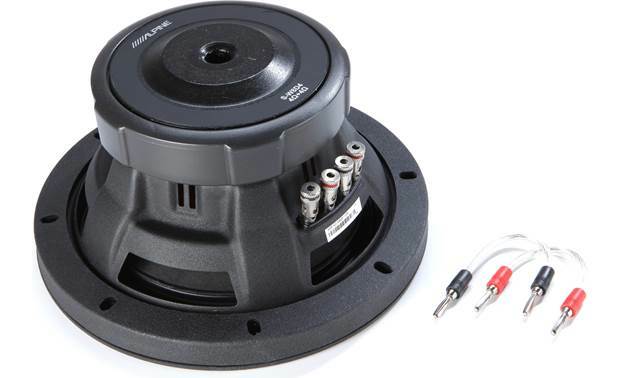 The oversized, inverted dust cap increases rigidity and virtually eliminates cone distortion at extreme volume levels. HAMRS: The woofer features a High Amplitude Multi Roll Surround (HAMRS) that allows a large linear excursion and greater SPL. The HAMRS design allows extreme excursions without sacrificing valuable cone area. Progressive Spider: The progressive spider has reinforced layer tinsel leads to ensure reliable and consistent control of the tinsel leads and eliminate any mechanical noise or interference often seen in high excursion cone designs. Compound Radius Curve Pole Geometry: Alpine's Patented Compound Radius Curve extended pole geometry ensures a symmetrical magnetic field, while optimizing flux density to reduce distortion and further improve power handling and output. 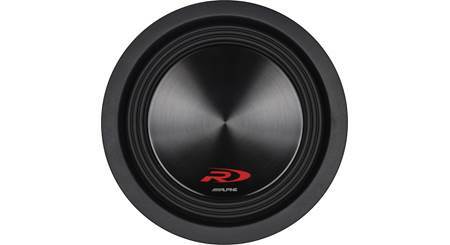 Dual Voice Coils: For system flexibility, the woofer has two 4Ω voice coils. When the voice coils are wired in parallel, the woofer presents a 2Ω load. When the voice coils are wired in series, the woofer presents an 8Ω load. Spring Terminals: The spring post terminals are all located on one side of the woofer. The terminals will accept pin connectors, single banana plugs, or bare wire up to 10 gauge. Jumpers: Included with the woofer are two voice coil terminal jumpers. These jumpers allow you to easily wire the voice coils in parallel (for a 2Ω load) or series (for an 8Ω load). Sealed Box: Alpine recommends a sealed enclosure with an internal volume between 0.18 and 0.53 ft³, with an ideal volume of 0.3 ft³. Sealed enclosures provide the most control over a woofer, will handle a lot of power, and provide accurate sonic reproduction, making them suitable to all types of music. Ported Box Volume: The recommended ported box volume ranges from 0.48 ft³ to 0.83 ft³, with the ideal size being 0.71 ft³, using a slot port measuring 7" (W) x ¾" (H) x 15½" (L). 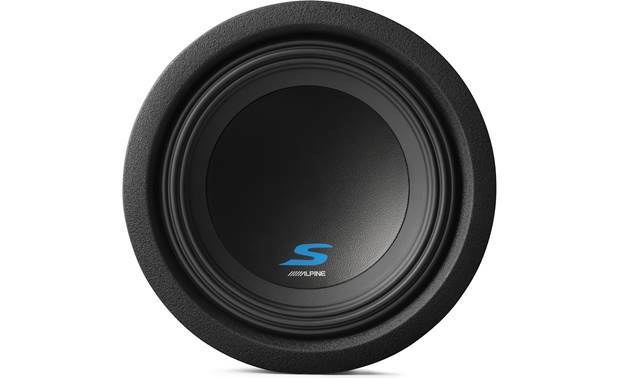 Searches related to the Alpine S-W8D4 S-Series 8" subwoofer with dual 4-ohm voice coils.